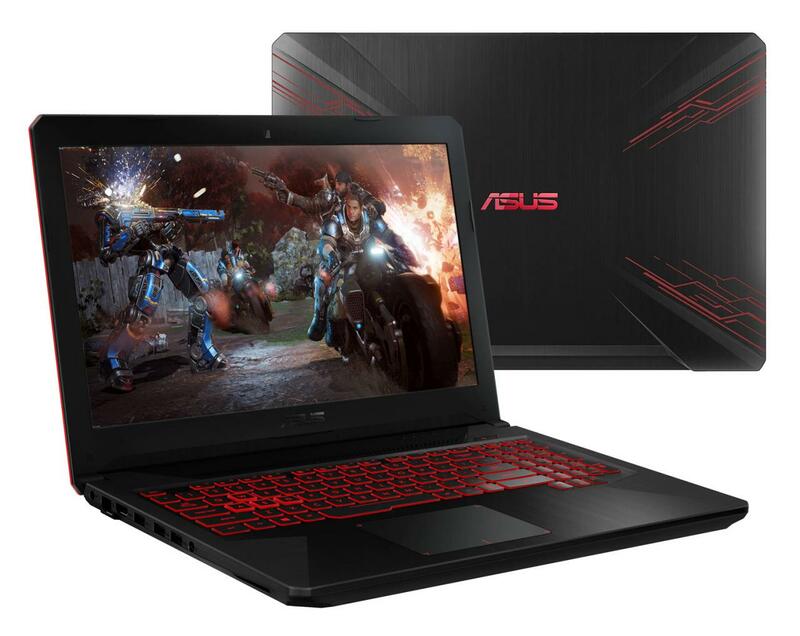 The Asus TUF FX504GD-DM917T is a new, 15-inch, game-oriented laptop designed for tight budgets. Its configuration revolves around a Quad Core i5 Coffee Lake, 8 GB of RAM, a large storage boosted by 16 GB Optane memory and GeForce GTX 1050 graphics support for a versatile gaming experience. A matte Full HD screen is also part of the lot, integrated into a new sleek design shell. Also have a red anti-ghosting backlit keyboard, a 7.1 audio output and a reworked dust-free cooling system. It’s a new design that Asus presents through its TUF line, at least in appearance. In the measurements as in the silhouette, it takes again the structure of its predecessor, the Asus FX503. 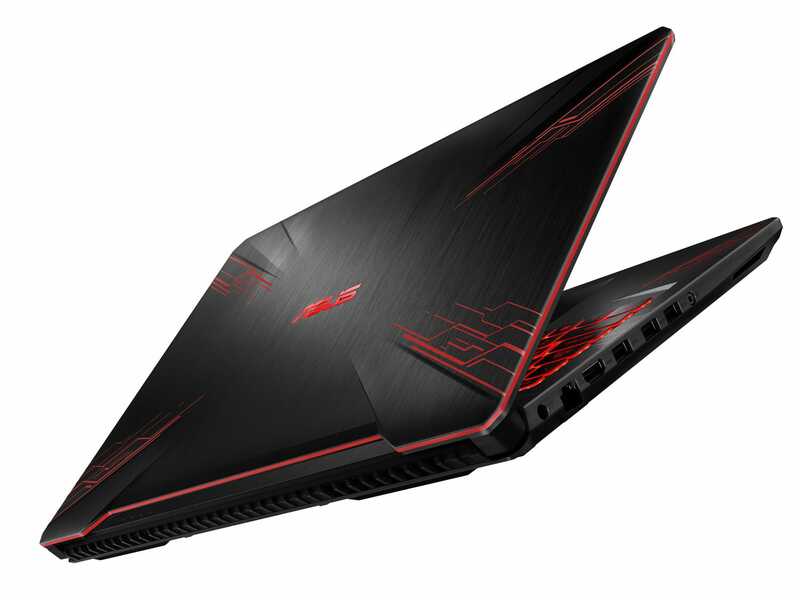 To know that Asus has presented four different designs for its FX504, including a very sober, a more structured and covered with a red pattern. We opted for the latter (Fusion) with no certainty that this is really the one applied to the 504GD-DM917T. Here, Asus seeks to assert its gamer positioning and keeps the red and black codes very present. The chassis is made entirely of plastic with a metallic finish on the back of the cover for the look and a slight gain robustness. Asus sells its TUF FX504 as particularly durable . The keyboard has been reworked for this purpose with an estimated lifetime of 20 million keystrokes for each key. It sports a red backlight with underscored ZQSD keys. The transport is not really the vocation of this laptop. But if you want to take it in your travels, know that the autonomy oscillates between 4 and 5 hours in Web browsing with active Wifi. The heart of thisAsus TUF FX504GD-DM917T is not without its plumb. And for good reason, the latest-generation Coffee Lake Quad Core i5-8500H gains significantly in performance compared to its predecessor the Quad i5-7300HQ. In particular, it is able to maintain better Turbo frequencies and is even more powerful than a Quad i7-7700HQ in some cases. This translates into perfect support for the versatile use of video editing, 3D rendering, programming, and engineering, with the flexibility of multitasking with 8 GB of RAM . A slight gain can also be observed in terms of game quality but this part is based mainly on the graphics card. Asus has called for this mission the GeForce GTX 1050 , a dedicated mid-range graphics card. Thought for the casual game, it allows to play all the titles of the moment in Full HD with a level of detail set to “High”. But do not expect to push the details on “Ultra” in Full HD, let alone play in 4K. Note that it is also a valuable support in the exploitation of programs taking advantage of the graphics card to accelerate processing (3D). Opposite, the storage does not have the chance to benefit from a SSD dedicated strictly speaking. Instead, Lenovo has a hard drive of significant capacity (1 TB) that “strengthens” a 16 GB SSD Optane cache . For MAC users, this system is similar to the Fusion Drive offered by Apple and speeds up the system startup / shutdown and the most frequently used applications. It is almost even at the level of a hybrid solution with a SATA3 SSD a little slow, ie the gain provided by this “cheap” solution. The screen is to match and put on conventional specifications. The Full HDresolution (1920 x 1080 pixels) offers a high display density while the matte treatment will limit the inconvenience associated with high ambient brightness and allow to clearly distinguish the action of the game. a simple TN panel will limit the viewing angles and reproduce a fairly inconsistent colorimetry and refresh rate is basic (60 Hz). Let’s end with the connectivity that surprises a little by its brevity. Indeed, it is gathered on the left side of the PC and consists of three USB ports including two USB 3.1, an HDMI output, a Gigabit Ethernet port, a headphone jack and a USB port. ‘food. That’s all. Asus has simply put aside the USB Type-C port and the SD card reader. The wireless modules are entrusted to Wifi AC and Bluetooth 4.1.